“Are you sure? Because normally when someone says, ‘in addition,’ they are usually adding something to an original list or statement,” the reporter quizzed. Of course the General didn’t really get asked that silly question. Therefore he didn’t really say those silly answers; I just joked that he did. Instead he was asked something much more serious about his opening statement. However, his response was just as elusive as the silly answers I just joked about. At 7 minutes and 25 seconds into the filmed account of the press release, it only took 8 seconds for General Newton to say, “In addition, our investigation found that there has been an erosion in adherence to weapons handling standards at Minot Air Force Base and at Barksdale Air Force Base.” He had already covered the data about the “isolated” event, and it was clear to see that he had prepared notes for the briefing. What does “in addition” mean? That “something else” was metaphorically called “erosion,” which everyone knows is something that happens over time due to some catalyst. For example, wind or water can erode the earth supporting a building, road, or a dam. Eventually the foundation begins to crumble, small pieces fall away, cracks in the structure appear, then widen, and eventually the entire structure fails. Small pieces have been falling away from the Air Force for years with little notice. Was the serious incident a crack appearing or widening? When is the structural failure coming? Something has happened to the Air Force. The Air Force used to be very good at adherence to tech orders, checklists, and procedures. Some time in the past, an erosion of standards began. That erosion is probably the root cause of the serious incident. The serious incident is only a symptom of that erosion. The people fired were, at the most, part of that erosion – not the cause of it. The cause of the erosion must be identified, targeted, stopped, reversed, and eliminated or other serious incidents are likely to happen in the future. By now, most of you have seen the picture of Obama standing in front of the Flag with his hands clasped in front of him as he casually gazes off to his right. 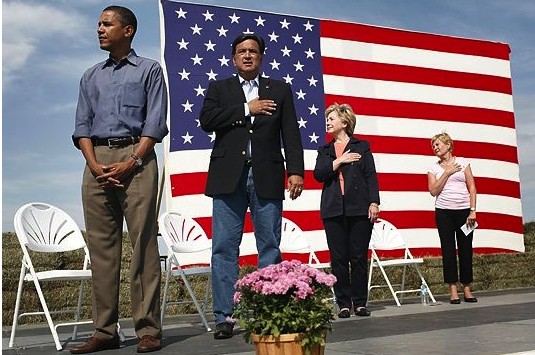 Behind him are his competing Democratic Party member Presidential candidates striking a typical “hand over the heart” pose, while the National Anthem plays.Snopes.com gives Obama every benefit of the doubt while makes every excuse possible to justify his behavior. The photo suggest that Obama must have something in his psyche that makes it seem right to him to not even show a modicum of respect for the nation that has given so much for him to live in the comfort he enjoys. Something indeed. Our current political behavior doesn’t make sense. Yes, it’s shorter, but at what cost? The one-page OPR format was made possible through data reorganization and a disappointing elimination of unit mission descriptions and the officers’ impact on those missions. The reorganization cost raters 33% of their space to assess their people, the additional raters gave up 20% of their space to concur, and the reviewers’ space was shrunk by 20%. However, most of the space was purchased by combining the pre-existing 6 performance factors, along with a new fitness factor, into one line, which requires only one X to be entered. The new form has been highly praised, but I’m not sure if it meets standards. So in 1988, “the mission” became the focus of officer performance reports. The unit’s mission was described at the top of the form and the officer’s performance was required to have an impact on that mission. The performance factors were reorganized into 6 and no writing was required to explain their performance, merely an X was placed in the meets, or does not meet, standards block. But now, all we’ve done is go full circle back to the pre-1988 form and leave out the writing part which explained the officer’s performance. It gives the appearance that the Air Force has decided that the mission doesn’t matter. The form is praised as being based solely on performance, but it appears future promotion boards will be making decisions based solely on 6 lines of assessment given by a rater with an unknown mission. Will the Air Force’s mission suffer if its officers focus more on their personal performance metrics than they do on their unit’s mission accomplishment? You can bet on it, because … it just makes sense. I read in the AF Times that he’s called Gen Welch to help look at things, not sure if that is as a formal part of the investigation. I wonder how an older B-52 general, former CINC SAC, COSAF would be impressed with the reorganization of the bomber force under the leadership of weapon-school grads, that being the most important qualification for leadership? Gen Welch was a doer, I had a conversation with him back in the summer of 1987 that resulted in copilots being called pilots and pilots being called aircraft commanders . . . yes that was my idea, but he made it happen. I wonder if an objective look will be made at a system that is a political faternal-order of school graduates which has literally defused our nuclear bomber force from any resemblance of the professionalism that was once common place. Remember when every unit had one or two idiots on the team, but they weren’t the guys in charge? I wonder if the inspectors will perform a comprehensive psychological and intelligence review of the crop of weapon-school leaders that control the bomber force. Then I wonder if they’ll conduct a similar test of the crew force that serves them. I wonder if the investigation will reveal the “brains” behind the process that gutted the aircrews’ ability to follow checklists or recognize nuclear weapons in a 6 out of 12 line-up. I wonder if there was anything else I could have done while I was on active duty to have prevented this mess – a mess we all saw coming. I wonder if the true test of leadership really is “knowing when to follow” or is it “knowing when to fall on your sword.” The personal results is about the same in each case, but the institutional results might have been better. I wonder if … it just makes sense. In 1969, President Nixon established a commission to develop a plan to return to the traditional all-volunteer military. Two years later, an all-volunteer baseline was established as pay was raised for all ranks. The entry-level recruit’s pay went up to $307 for October 1972 from a stark $130 a month the year prior. After adjusting for inflation, the new recruit enjoyed over 221% of his previous buying power. An E-4, with over 4 years in service, got a 21% increase, while most other ranks enjoyed nearly a 10% increase in their buying power. Officially ending in 1973, the longest draft in American history had lasted almost 25 years. It has been over 34 years since the all-volunteer force has been standard operating procedures. It defies common logic to suggest a draft is needed when tens of thousand of qualified airmen and sailors are being required to leave service against their personal desires. Congress establishes each service’s end strength. When a service exceeds its authorization, they are required to reduce their numbers. For example, in 2003 the Air Force and Navy forced thousands of “overage” people to leave. Our military is the size it is today because our elected officials have so ordered. It is true that the all-volunteer force has had cyclical problems with retention. However, those problems were the result of a failure to maintain the 1972 base-line pay scales. Decision makers used the power of inflation and lagging pay adjustments to shave funds off of personnel costs. By the end of 1980, all service members had lost 17% of their buying power. The Air Force was short thousands of pilots and the Navy was parking ships because they didn’t have enough petty officers to float them. The nation reacted to the mass exodus and brought military compensation to where in 1993, it actually exceeded the 1972 base-line only for a short while. After the Soviet Union dissolved, the Cold War was over, and then the startling quick victory during the Gulf War, Congress reduced the end-strengths by nearly 40%, which made some sense at the time. What didn’t make sense was a deliberate effort to deviate from the 1972 all-volunteer baseline. History had already shown that an all-volunteer force needed a certain amount of compensation and quality of life. Dropping below that amount jeopardizes retention and recruitment. When 9/11 hit, the military was almost down to the pay scale equivalents of 1980. However, retention had been manipulated during the down-sizing through the use of targeted bonuses in order to retain key career fields, while the overall base pay’s buying power continued to wither. The terrorist attacks on our nation reinvigorated our best and brightest to serve, recruitment went up, separations and retirements were put on hold. And for a while, quality of life issues took a back seat as a new generation of heroes answered the call to arms. Our enemy’s strongholds in distant mountains and harsh deserts were rolled into a ball and buried. With the toppling of two national governments behind us, a protracted war of dealing with a network of organized terrorists, mostly intent on undoing what we’ve started, wearies us as the nation rests safely behind our all-volunteer force. As our soldiers, sailors, airmen, and Marines deploy over and over and over to remote regions of the earth to fight, build, defend, and occasionally witness their comrades make the ultimate sacrifice, some folks look at falling retention and strained recruitment and say we need a draft. In reality, we just need to correct back to the 1972 all-volunteer base-line. Even after the latest targeted pay raises, the 2007 recruit’s $1,203.90 has less than 78% of the buying power of the 1972 recruit’s $307. An E-4’s $1978.50 has a little over 87% of the buying power of his 1972 counterpart’s $445.50. For a Major, with over 14 years of service, to equal the buying power of his 1972 counterpart’s pay, he would need a base pay increase of nearly $465 a month. A draft is not going to fix that problem. It is one thing to ask young people to offer the prime of their learning and earning years for the defense of the common good. It is another to expect them to make a career of it, while their families’ quality of life is less than their historic counterparts. We need to stop experimenting with trying to see how little we can compensate personnel for their military service and just accept the 1972 baseline as a fixed expense for the price of an all-volunteer military. You are currently browsing the It Just Makes Sense blog archives for October, 2007.